The city of Philadelphia was founded in 1682 by William Penn at the confluence of the Delaware and Schuylkill rivers. However, this area had been colonized by the Swedes and the Dutch, they fought for the control of the Delaware Valley between 1623 and 1655. The Dutch in 1655 conquered the Swedish territories. The English conquered the Dutch colony in 1664. The start of the Third Anglo-Dutch War resulted in the recapture of New Netherland by the Dutch in August 1673. The signing of the Treaty of Westminster of 1674 ended the Dutch control on the Delaware Valley. The Dutch colony was finally ceded to the British. In 1681 Charles II of England granted William Penn a charter for what would become the Pennsylvania colony. In the 19th century an important flow of immigrants, mostly German and Irish, settled in Philadelphia and the surrounding districts. The Christmas village of Philadelphia of course does not go back to this immigration. But it is an event that has developed recently. It, however, recalls the old German tradition of the Christmas markets. These markets were born in Germany in the fifteenth century. The oldest, the Dresden’s Strietzelmarkt was first held in 1434. Christmas Village in Philadelphia – Located at LOVE Park. The Christmas market of Philadelphia is an authentic German Christmas market in the LOVE Park of Philadelphia. 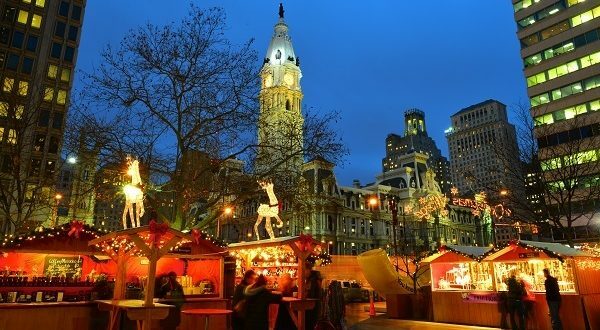 The Christmas Village of Philadelphia is a typical outdoor market – modeled on the traditional Christmas markets of Germany – made up of more than 70 wooden cabins which sell high quality handicrafts, ornaments, jewelry, traditional food, sweets and drinks typical of European Christmas. The unique atmosphere with thousands of lights, the big tree festival, the delicious smell of waffles, gingerbread, bratwurst and mulled wine help to create the classic Christmas atmosphere. Opening Hours: General Opening Hours: Sunday – Thursday: 11:00 am – 7:00 pm. Friday – Saturday: 11:00 am – 8:00 pm. Holiday Opening Hours: Thanksgiving Day : 9:00 am – 5:00 pm. Christmas Eve : 11:00 am – 5:00 pm.